Pencils Down? 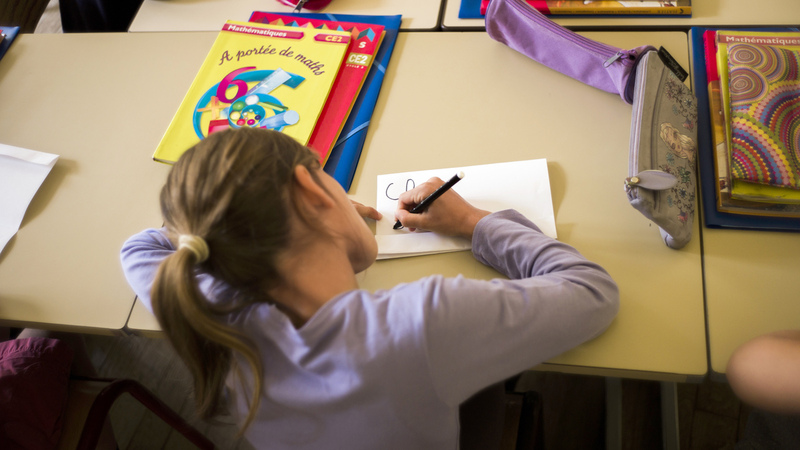 French Plan Would End Homework President Francois Hollande says the extra work penalizes students with difficult home situations, proposing doing away with homework in elementary and junior high schools. But others argue the individual work is exactly what those students need to succeed. As part of an effort to overhaul education in France, President Francois Hollande is proposing the elimination of homework. In the name of equality, the French government has proposed doing away with homework in elementary and junior high school. French President Francois Hollande argues that homework penalizes children with difficult home situations, but even the people whom the proposal is supposed to help disagree. It's 5:30 p.m. and getting dark outside, as kids pour out of Gutenberg Elementary School in Paris 15th arrondissement. Parents and other caregivers wait outside to collect their children. Aissata Toure, 20, is here with her younger sister in tow. She's come to pick up her 7-year-old son. Toure says she's against Hollande's proposal to do away with homework. "It's not a good idea at all because even at a young age, having individual work at home helps build maturity and responsibility," she says, "and if it's something they didn't quite get in school, the parents can help them. Homework is important for a kid's future." Toure lives with her son, her little sister and her mother in public housing near the school. On the surface, it seems just the sort of family environment that might put a child at a disadvantage. Yet Toure says she sits down with her son every night, even though she's in law school and has her own studies. "Poor people want homework because they know that school is very important, and the only chance — the only possibility — they have to give their children a better life is if their children succeed at school," says Emmanuel Davidenkoff, editor-in-chief of L'Etudiant, a magazine and website devoted to French school and education. Davidenkoff says the Socialist government doesn't seem to understand the concerns of the working and middle class and in the name of equality, got it all wrong. President Francois Hollande argues that homework puts poor children at a disadvantage, but others argue the extra work is needed to help those students succeed. "Mostly, wealthy people don't want homework because when the kids are at home, they make sports or dance or music. They go to the museums, to the theater. So they have this access to culture, which is very important," he says. "In poor families, they don't have that, so the only link they have with culture and school is homework." Elisabeth Zeboulon sits in her office over the playground. Today, she's the principal at a private, bilingual school in Paris, but she spent most of her career in French public schools. Zeboulon says the centralized French education system doesn't leave much room for trying different teaching methods. "The kids are very different from one place to another, from one school to another, and we don't have much way of adapting," she says. "And whenever they start saying, 'Well in this place we could do this, in that place we could do that,' then you have a lot of people coming up and saying, 'Look, it's not equal.' "
Cutting homework is just part of an effort aimed at making primary and secondary school a happier, more relaxed place for children. 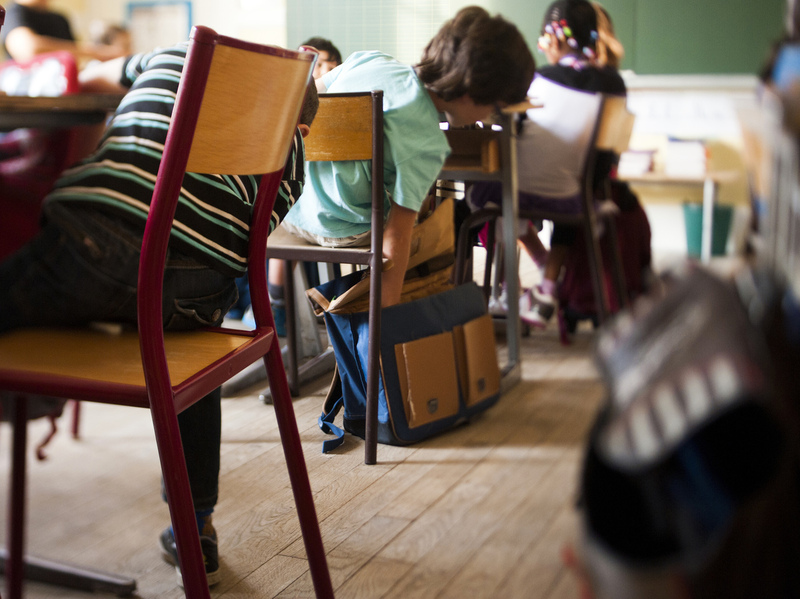 The school week will be lengthened — currently, French children have Wednesdays off — but the school day will be shortened. Kids get out so late here there's no time for extracurricular activities. Basically, French school is a grind, says Peter Gumbel, author of a scathing book on the education system in France. "There's an enormous amount of pressure, and it's no fun whatsoever. There's no sport or very little sport, very little art, very little music. Kids don't have a good time at all," he says. "And it's not about building self-confidence and encouraging them to go out and discover the world. It's much more about, sit down and we'll fill your empty heads with our rather dull and old-fashioned knowledge." There's another big reason the French government is making changing school policy a top priority, Gumbel says. "The French are discovering — to their horror — that their performance internationally has been declining over the last 10 years. The French actually are performing [worse] than the Americans in reading and science," he says. This is a huge shock, Gumbel says, to a country that long considered itself an education pioneer.